Light-emitting diodes (LEDs) and advanced power electronics devices can greatly improve energy efficiency across all U.S. energy sectors. LEDs are 5-10 times more efficient than incandescent bulbs, and advanced power electronic devices could reduce U.S. energy consumption by at least 1.5% annually by displacing lower-efficiency silicon devices. Gallium nitride (GaN) is a material that could enable both of these technologies. However, adoption into large-scale applications has been inhibited by high costs, which are due in part to the absence of inexpensive native substrates; GaN substrates are difficult and expensive to fabricate. But if highly efficient, low-cost LEDs fabricated on native substrates are deployed widely in both commercial and residential applications, the new native-substrate-based LED technologies could lead to savings of up to 350 terawatt-hours of electricity per year (an 8.5% reduction), roughly equivalent to the output of forty-five 1,000-megawatt power plants. GaN substrates today are made by hydride vapor phase epitaxy (HVPE) on sapphire substrates. Although HVPE deposits material quickly, the number of wafers that can be packed into a reactor is limited. Also, the quality of materials currently made by HVPE is not sufficient for advanced power electronics applications. A key to low-cost and high-quality GaN substrates could be found in large ammonothermal reactors (Figure 1). Although these have a lower growth rate than HVPE reactors, they can load many wafers, and grow them thicker so that multiple GaN wafers could be sliced from one seed. If large-scale ammonothermal reactors (which have never been demonstrated commercially in the United States) could be proven with a crystal growth rate of 10 microns per hour, they could produce lower cost and higher quality GaN than is possible by HVPE. 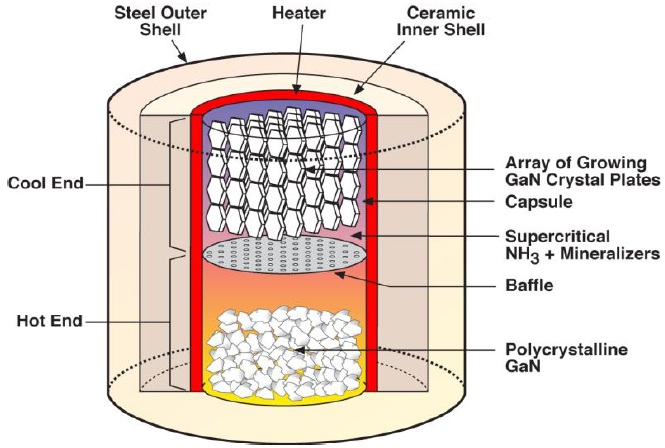 The goals of the Soraa OPEN 2009 project included building a 6-inch diameter ammonothermal reactor, prove it could be operated safely, grow high quality GaN crystals at a rate of at least 10 microns per hour, and demonstrate growth of 2-inch bulk GaN crystals and fabrication of 2-inch GaN wafers (Figure 2). The ammonothermal GaN crystal growth method is adapted from the hydrothermal method used to grow quartz crystals, which are very inexpensive and represent the second largest market for single crystals for electronic applications (after silicon). Soraa also received an award through the Strategies for Wide-Bandgap, Inexpensive Transistors for Controlling High-Efficiency Systems (SWITCHES) program, to conceptually demonstrate they could scale a reactor up to even larger diameter, and fabricate wafers larger than 2 inches in diameter. Soraa successfully built a 6-inch reactor that is more than 350 times larger than earlier protoypes by overcoming challenges related to welding the capsule closed so that it does not leak, maintaining an even temperature distribution, and reinforcing the reactor to contain high pressure ammonia safely. The 6-inch ammonothermal reactor is capable of more than 600 degree Celsius operation and a pressure greater than 3,000 atmospheres; Soraa was able to grow GaN crystals at the target rate of 10 microns per hour and beyond. Soraa’s reactor design and growth process eliminates leaking, improves temperature uniformity, optimizes internal loading of seeds and polycrystalline raw material, increases heater lifetime, and improves growth uniformity at all locations throughout the capsule. Soraa has now operated the 6-inch reactor since 2011. 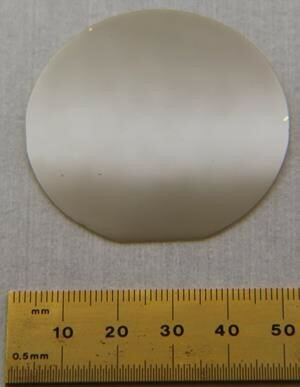 Soraa has fabricated 2” wafers that meet their target specifications for LED crystal quality, dopant levels, dislocation density, miscut, and surface roughness. These wafers are sufficiently transparent to produce LEDs. Soraa has also shown that with additional processing steps, they have the ability to make wafers with a dislocation density less than 1x104 cm-2, a breakthrough that will enable higher-peforming power electronics devices with a breakdown field greater than 3 MV/cm. Soraa introduced its first commercial products, MR16 LED lamps, in 2012. These are made by depositing GaN on bulk GaN substrates. GaN-on-GaN growth results in fewer dislocations, allowing Soraa to drive their LEDs at a current density of 250 A/cm2 without a significant decrease in efficiency (“droop”) compared to ~35 A/cm2 for GaN grown on sapphire. This results in more light being produced from a smaller area. Soraa’s ammonothermal process is intended to produce substrates at a lower cost than is possible by current technology because it allows more and thicker samples in one run. Soraa is optimizing their growth process in the 6-inch reactor to create GaN crystals that can be sliced into wafers meeting LED specifications, which will then be used by Soraa to make LED lamps. Soraa will continue to improve their process to make lower dislocation density GaN crystals for power electronics applications. Ultimately, the goal is to build a commercial GaN growth facility. Right now, GaN substrate vendors are focused on delivering substrates with a diameter of at least 2 inches, primarily for LED applications. Larger substrate sizes and higher substrate quality (lower dislocation densities) will be critically important for enabling higher power LEDs and power electronics devices based on GaN. Laser diodes are another potential application. But the wafer size will need to increase to 4-inch diameter and be sold for less than $1,500 to achieve widespread adoption, according to a 2013 report citing analysts at Yole, an authoritative source of industry projections in the power electronics domain. Soraa has already shown they can build and safely operate 6-inch reactors that produce high quality ammonothermal GaN crystals. Semiconductor wafer sizes must continually increase in order to drive down costs; Soraa’s innovations will help to enable the continuous scaling of GaN wafers to 4 inches and beyond, which is necessary to achieve widespread penetration and improve U.S. energy efficiency. W. Jiang, D. Ehrentraut, J. Cook, D. S. Kamber, R. T. Pakalapati, and M. P. D’Evelyn, “Transparent, conductive bulk GaN by high temperature ammonothermal growth,” Physica Status Solidi B 252 (2015) 1069-1074. W. Jiang, D. Ehrentraut, B.C. Downey, D.S. Kamber, R.T. Pakalapati, H. Yoo, and M.P. D’Evelyn, “Highly transparent ammonothermal bulk GaN substrates,” Journal of Crystal Growth 403 (2014) 18-21. W. Jiang, D. Ehrentraut, J. Cook, D. S. Kamber, R. T. Pakalapati, and M. P. D’Evelyn, “High quality, low cost ammmonothermal bulk GaN substrates,” Japanese Journal of Applied Physics 52 (2013) 08JA01.